Soldier, a moment please. Would you tell us what brings you to Fort Griffin? Pardon, sir, but I don't have much time to talk. Got to stable my horse and get some things in town for General Sherman. 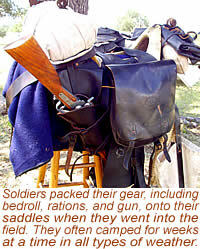 We'll be heading on out in the morning, probably early, bound for Fort Richardson. We've been escorting the general all across West Texas…Fort Mason, McKavett, Concho. We've come all the way from San Antone with the general, all of us from the Tenth Cavalry. We were all picked special for this trip. Spent some time talking with the boys from the Ninth here at Fort Griffin. They're all like us…colored troops. Listening to them, sounds like they been used pretty hard down here. I think maybe we've been lucky. We've been up in the Indian Territories, 'cross the Red River. Don't see so many of those old rebel rascals as they got down here in Texas. I don't mean to say we've had no hard duty up there. I've pitched my tent in three foot of snow in the wintertime. Been under summer sun so hot I was seeing stars in the middle of the day. Marched three days and nights with just a pint of water and half a pound of bread. Up in the Territories, that's where the Cheyenne Indians took to calling us "Buffalo Soldiers." Boys in the regiment kinda like it, take it as a sign of respect. Boys in the Ninth like the sound of it too. Lots of us boys, Tenth and Ninth both, hail from back in Kentucky. I was just 18 when I joined up, over near Lexington. Liked the idea of being around horses, been around 'em since I was little back in the slavery times. Been in the regiment four years now, got one more year left on my time to do. I reckon most of the boys is going to stay with the Army when their time runs. We maybe don't get too much respect from the officers in the other regiments, sometimes not even from our own officers. They're all white. But we got respect for ourselves, and we're getting respect for our people. I tell you what, the white folks sit up and take notice when they see the general of the whole United States Army guarded by colored troops. Begging your pardon, sir, but I got to be taking my leave now. I can't be keeping the captain waiting, or he'll have me in the guardhouse for certain. Sergeant Emanuel Stance (second from left) and troopers of the Ninth U.S. Cavalry battle Apache Indians north of Fort McKavett in 1870. For his valor, Sergeant Stance was awarded the Medal of Honor, the first given to an African-American soldier. 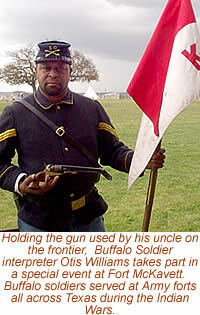 Many Black troops served on the Texas Frontier, including the Ninth and Tenth Cavalry and 24th and 25th Infantry. Many were newly freed slaves from the south who viewed Army service as an opportunity for honorable work as well as a chance to receive an education. With Army chaplains as instructors, the troops learned to read and write for the first time. 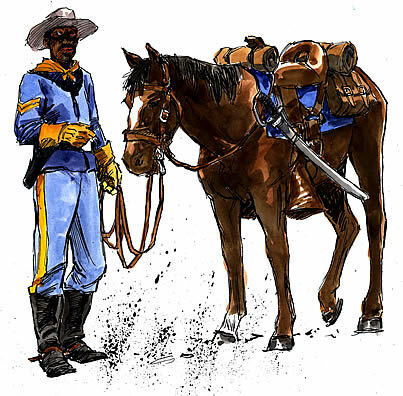 In addition to battling Indians, the Buffalo Soldiers tracked outlaws, Mexican Revolutionaries, and cattle rustlers and mapped large territories of the southwest. They provided protection to crews building railroads and helped string hundreds of miles of telegraph wire, opening new lines of communication across the West. Buffalo Soldiers, including troopers in New Mexico (left); soldiers at Fort Griffin (center), and members of the 25th Infantry, shown at Fort Snelling, Minnesota, in 1883 (right). Credits: Character dialogue by Steve Dial; top painting by Charles Shaw; photos of Buffalo soldiers at Fort Griffin (top and bottom center), courtesy of the Old Jail Art Center (Robert Nail Collection); photos of soldiers gear, hardtack, and interpreter Otis Williams by Susan Dial at Fort McKavett SHS; painting of Sgt Emmanuel Stance (The Redoubtable Sergeant) by Don Stivers; Medal of Honor replica at Fort McKavett SHS; photo of three Buffalo Soldier interpreters, courtesy TPWD; photo of Buffalo Soldiers in New Mexico, courtesy of Ken Pollard and the Buffalo Soldier Archives, Fort McKavett SHS; photo of 25th Infantry at Fort Snelling courtesy National Archives.